Whenever I ask Ella if she’d like me to make a play material, she always requests slime! It is a sensory-seeking kid’s dream! Cool to the touch, squishy, stretchy, moldable, and just the right amount of messy. Using sensory play to teach other concepts is a great way to actively engage children’s brains and allow for deep learning (“semantic learning”). Before we get to the recipe, I had to tell you that it’s finally here! 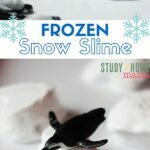 I wrote The (Ultimate) Slime Book oozing with over 50 pages of stretchable, squishy sensory fun – including a year of seasonal slimes, edible slimes and unique ways to play with slime. Click here to get more details. 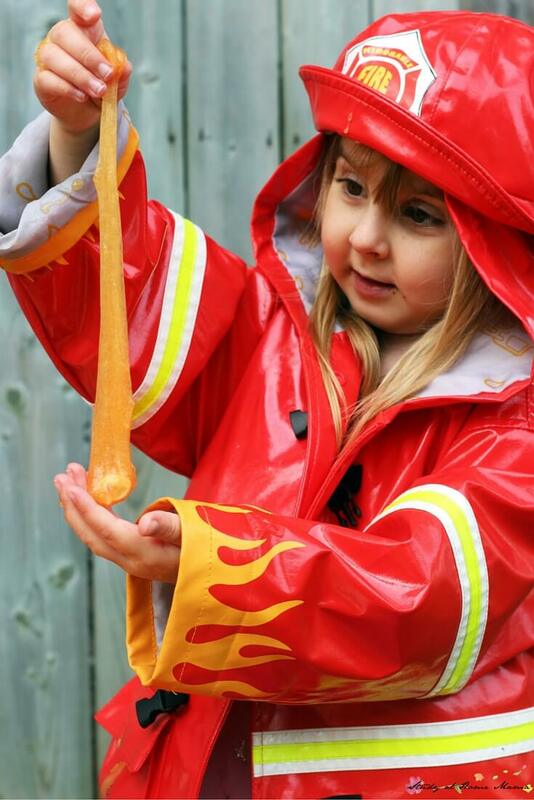 The first time you make slime it is a bit of an experiment, getting that perfect stretchy, slimy texture without the slime being too sticky or tough. 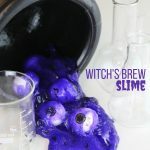 After a couple of batches though, you will be able to know when your slime is ready for play – I find mine always needs a few minutes of kneading, and sometimes a tablespoon or two of water to get that stretch! 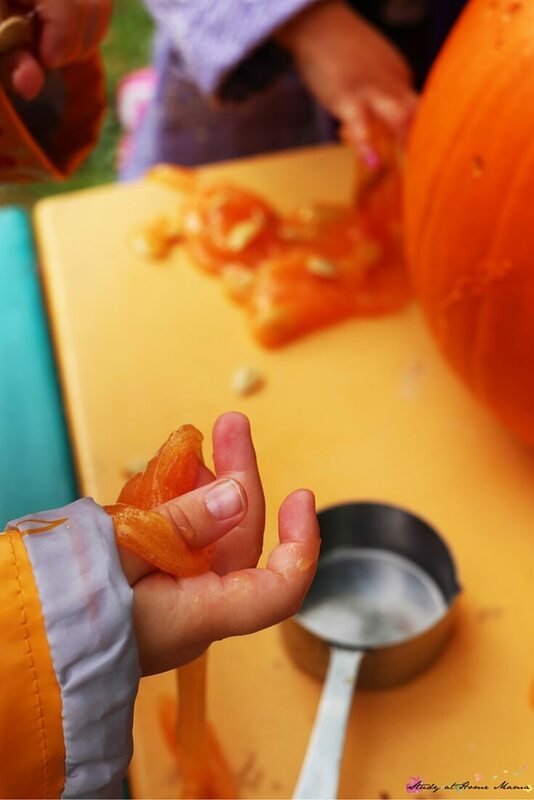 Knead the pumpkin seeds into the slime, and place in a hallowed out pumpkin or a big bowl for some pumpkin sensory play! 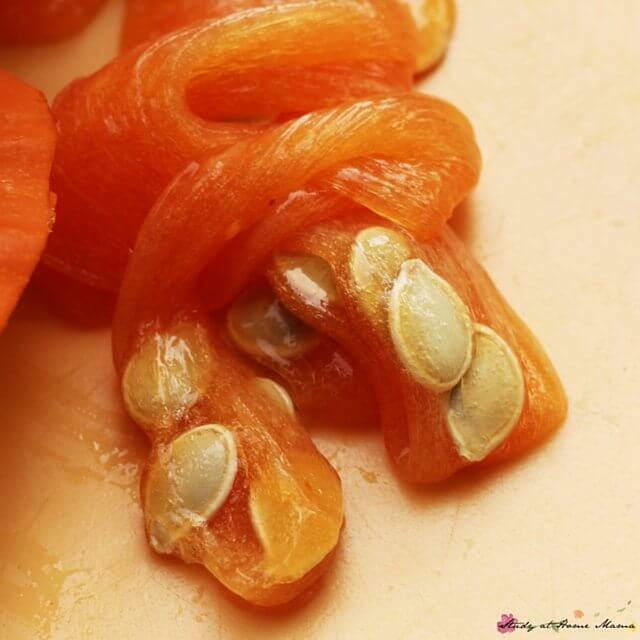 Just like pumpkin guts, only a lot more fun – and surprisngly, less messy. 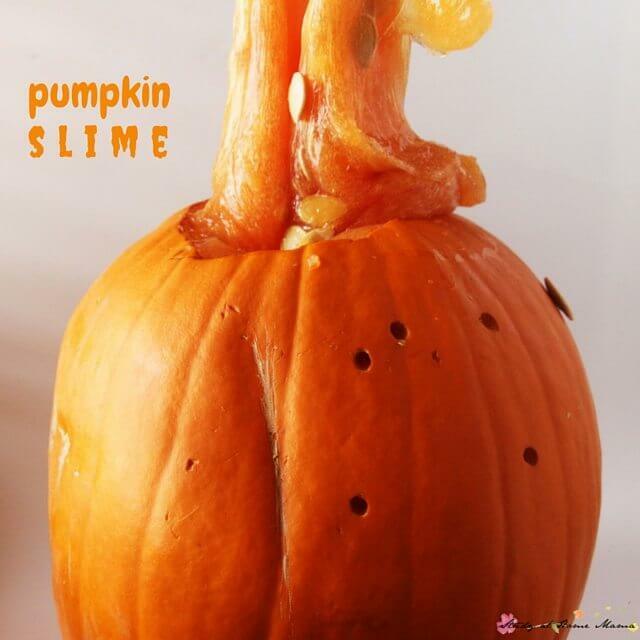 I used our pumpkin from our pumpkin drilling activity to help present the slime. I placed a bowl inside the pumpkin and filled it with the slime. I replaced the “pumpkin lid” and encouraged the children to take a peek! Presenting the slime inside the pumpkin won’t cause any damage to the pumpkin – once it’s carved it slowly starts to deteriorate anyways, so I figure might as well get as much fun as you can out of it! 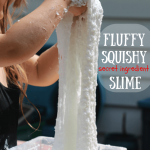 For a long time, Ella just liked to flatten and squish her slime – spreading it out as far as she could on the table, covering as much of the surface as possible. Now she really likes picking it up, pulling and stretching it. And it is sooo stretchy! If your child happens to get some on their clothes, hair, or on the carpet, the slime can be easily removed with a bit of vinegar. I’ve learned this the hard way, after trying to use soap, conditioner, peanut butter, and combing out slime from Ella’s hair for over an hour. Less than thirty seconds soaking that section of her hair in vinegar and the slime was completely removed (although her hair was a bit dry). 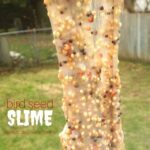 Our pumpkin seed slime lasted for about a week before I threw it out. I always double check it’s consistency before re-introducing to the kids, as sometimes the starch separates, or I find that it’s gotten sticky overnight and needs some tweaking. I throw it out when it starts to thin out, as that just seems too messy, though I’m sure it would still be fun. 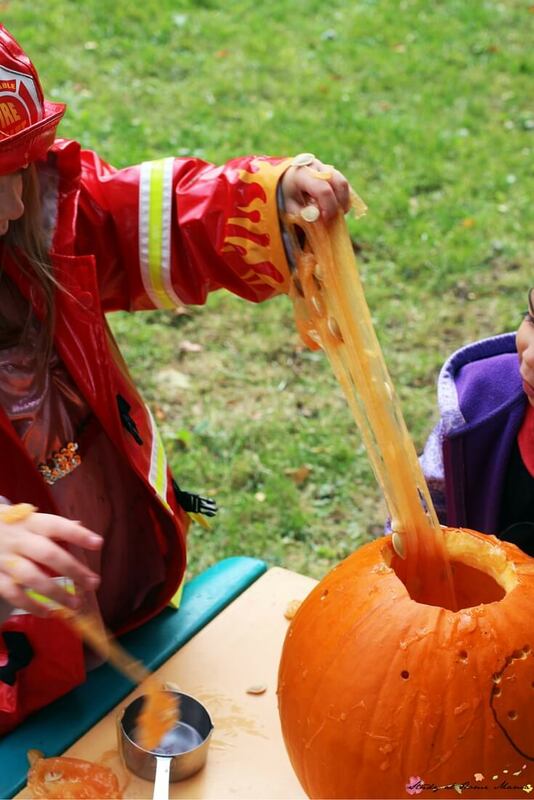 You can alternatively pour it into a large ziplock bag at that point for a completely different sensory experience of squishing the slime through the bag and trying to push the pumpkin seeds into a design. 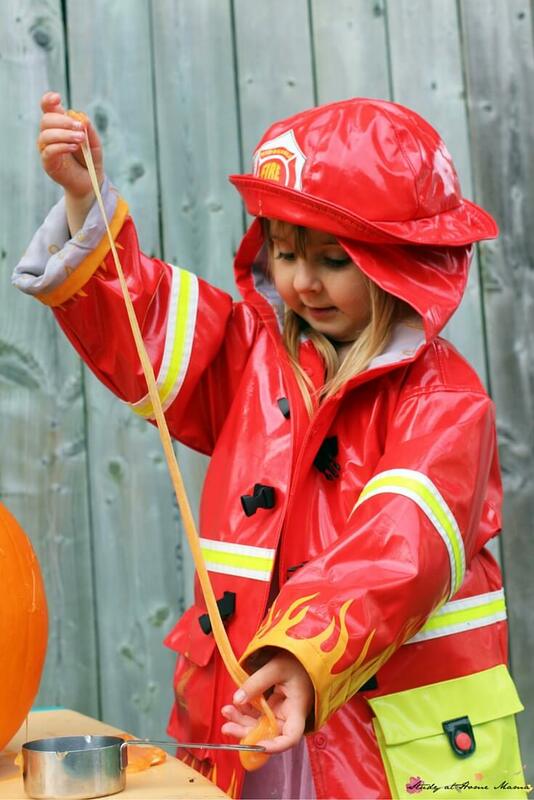 What are your kids’ favourite fall sensory activities?